In 1973, the feudal ruler of Afghanistan, King Mohammed Zahir, was ousted in a palace coup and replaced by his cousin Mohammed Daoud who proclaimed himself President with the title of Khan. Only in April 1978 were the revolutionary forces of Afghanistan finally able to overthrow Daoud’s repressive feudal regime in the Saur Revolution led by the People’s Democratic Party of Afghanistan (PDPA). The assasination of Prime Minister Maurice Bishop by the USA drew a scathing international response. The numerous prisons were opened amid general rejoicing. In Australia, Prime Minister Malcolm Fraser welcomed the Afghan Revolution as a triumph of democracy. The US intelligence agencies saw it differently however, interpreting this popular uprising as another Cuba and facilitating “Soviet expansionism”, and therefore something to be thwarted at any cost. The US sought allies among the various counter-revolutionary groups that emerged but found their keenest supporters among the most backward Islamic clergy who feared losing their influence and privileges and also feared the new government’s radical ideas, like educating women and girls. These militant Islamic groups were also supported by the regime of Muhammad Zia-ul-Haq in neighbouring Pakistan who had his own reasons for wanting turmoil next door. The United States Central Intelligence Agency (CIA) launched a program code-named Operation Cyclone to organise, arm and finance these backward, Moslem fanatics in a Jihad or holy war against the revolutionary government. The terrorist campaign engaged in by the US and Pakistani-backed (and well-armed) mujahedeen targeted any in the civilian population who showed sympathy for or even an interest in the programs of the revolutionary government. The Soviet Union intervened to aid the PDPA government in their fight with the mujahedeen which allowed the US to step up their propaganda that the war in Afghanistan was being waged against “Soviet expansionism”. A partial boycott of the Moscow Olympics was organised. In 1989, under Gorbachev, the USSR ended its support for the PDPA whose leader Mohammad Najibullah struggled on alone against the Islamic fanatics until 1992 when the PDPA forces were finally overwhelmed and Najibullah was brutally murdered. Operation Cyclone was one of the longest and most expensive covert CIA operations ever undertaken; funding began with US$20–$30 million per year in 1980 and rose to US$630 million per year in 1987. Funding continued until the overthrow of the PDPA. Having created, trained and armed the mujahedeen, the US then found that they no longer had control of their creation and they have been waging war against them in Afghanistan ever since with no end in sight. In 1979 the left-wing, socialist-oriented Sandinista Junta of National Reconstruction took government in Nicaragua. Once again, the US backed and funded a collection of right-wing rebel groups of which the largest was the misnamed Nicaraguan Democratic Force (FDN). They were openly counter-revolutionary and were called “contras” from the Spanish contra, which was short for la contrarrevolución. The military significance of the contras decisively depended on the financial and military support they received from the US government. During their war against the Nicaraguan government, the Contras pursued a program of systematic human rights violations and terrorist attacks. Supporters of the Contras tried to downplay these violations, particularly the Reagan administration in the US, which engaged in a campaign of so-called “white propaganda” to alter public opinion in favour of the contras. Despite their best efforts, US support for the contras was banned by Congress, so the Reagan administration sought ways to covertly continue it. These covert activities involved illegal arms sales to Iran with the proceeds being used to fund the contras. It became public as the Iran–Contra affair. Some rebels disliked being called contras, since they wanted to be seen instead as “supporters of democracy”. Still less did they want to be seen as desirous of wanting to restore the hated old order. So they referred to themselves with the nebulous but macho term comandos (“commandos”); from the mid-1980s, the Reagan administration began calling the terrorist movement in Nicaragua the “democratic resistance,” rebels promptly started describing themselves as la resistencia (presumably resisting the spread of Godless Communism). Resisting the spread of Godless Communism was also the excuse for the US invasion of Grenada in 1983. Grenada, situated not far from the coast of Venezuela, is a tiny nation of less than 350 square kilometres. Yet US planners portrayed it as a threat by to their hegemonic control over the “free world”. Grenada had gained independence in 1974, after enduring three hundred years of French and British colonialism. After independence, however, the prime minister Sir Eric Gairy terrorized the population via his secret police outfit, the Mongoose gang using arms secured from Chilean dictator, Augusto Pinochet. 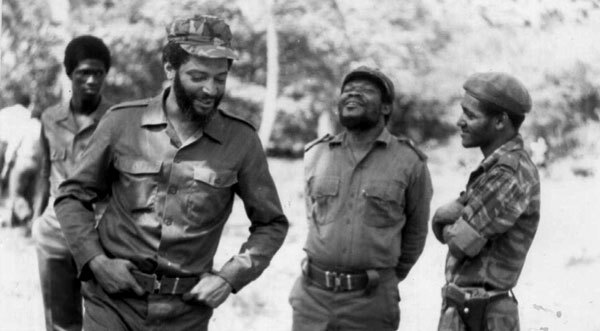 In March 1979 (while Gairy attended a UN conference in New York) Maurice Bishop, head of the People’s Revolutionary Party of Grenada, ousted Gairy. The usual pretexts for the invasion of Grenada were put forward by the US government, and obediently relayed by the “free press”: Grenada had become a “Marxist dictatorship”, there was a Cuban military presence on the island allegedly building airfields with which to attack US territory, there were American students on the island who were in danger and the US army was on a “rescue mission”. That the true reason for the invasion was to expel a government not amenable to American hegemonic demands was painfully obvious. Even America’s allies were aware that the Reagan administration was terrified that tiny Grenada might act as a further example of defiance (after Cuba) in “the American hemisphere”. The American government, under President Reagan, however, thought it could do as it pleased in the region and accordingly invaded the Caribbean island and killed the Prime Minister Maurice Bishop. This drew a scathing international response from the UN General Assembly which “deeply deplored” the US invasion as a “flagrant violation of international law”, further condemning “the deaths of innocent civilians”. The US intervention was even opposed by most NATO countries and US allies such as France, Portugal, Australia, Spain and the Netherlands. The people of Grenada have nevertheless suffered the consequences ever since.